Traffic is crucial to any online business. At the end of the day, we have goals, priorities and need to make ends meet. You may have the best looking website but if you don't have people looking at your site, then it'll be just another small fish in a big pond. 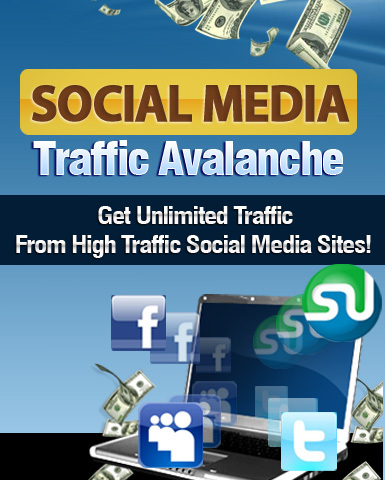 You need an avalanche of traffic from Social Media! Traffic is crucial to any online business. At the end of the day, we have goals, priorities and need to make ends meet. You may have the best looking website but if you don't have people looking at your site, then it'll be just another small fish in a big pond. So How Can You Generate An Avalanche of Traffic? Most entities that either establish their business on the Internet or bring their business to the Internet usually learn one very important thing about the ‘net: more traffic, more profit. This is why everyone and their mothers are tinkering with everything on the Internet in order to increase the number of “eyeballs” that float over their products and services. One particularly interesting aspect of the Internet has proven to be a very useful and profitable tool for any kind of business. It has been growing rapidly over the years, and has become part and parcel of any netizen’s life. Millions upon millions of unique people access its varied forms each day; each having his or her own purpose for doing so. And the best part is that very little money – if any at all – is needed to make use of this aspect of the Internet. You could say that the buzz has been piling up over the years, and that we are now reaping the full benefits of the “avalanche” that it has created. And this avalanche is known as social media. Fortunately for you, I've written a special report detailing how you can leverage the power of high traffic social media sites.